The theater program at La Salle has been in existence since 1969 and now as we prepare to celebrate our fiftieth production, we take great pride in how the program has evolved to where it integrates the talents of well over 125 students each year including female performers from our sister schools, Gwynedd Mercy Academy and Mount Saint Joseph's Academy, as well as a variety of other surrounding schools, both public and private. The overall goal of the program is to produce the highest quality shows while allowing everyone who expresses an interest to find their niche in the school's performing arts program. To accomplish this we produce two shows per year, starting with a comedy or drama in the fall and a full scale musical in the spring. The theater program also provides an opportunity for students to develop and express theirs talents not only as on stage performers, but also as musicians, technical support, and in administrative capacities. La Salle College High School performed the high school adaptation of the the six-time Tony Award winning musical, Chicago - High School Edition, from Thursday, March 14 – Sunday, March 17, 2019. Chicago (High school Version) is an American musical with music by John Kander, lyrics by Fred Ebb, and book by Ebb and Bob Fosse. In razzle-dazzle, roaring twenties, Chicago is a tale of the sensational murderess Velma Kelly, the reigning queen of the Cook County jail, and Roxie Hart, the newest of the merry murderesses, who, of course, haven't really committed any crime (their men had it coming). They are both headline hunters seeking to capitalize on pre-trial publicity for the sake of acquittal and stage careers. The story is told through a succession of vaudeville acts: Roxie's pre-trial prison career, the trial itself in which she is defended by the slickest lawyer in town, Billy Flynn, and her acquittal and return to obscurity. Chicago is a story of murder, greed, corruption, and treachery-all those things we hold near and dear to our heart. It is jurisprudence-as-showbusiness and trial-by-publicity. The original Broadway production opened in 1975 and ran for 936 performances until 1977. Bob Fosse choreographed the original production, and his style is strongly identified with the show. Despite mixed reviews for the original production, the show was revived in 1996 to rave reviews, and now holds the record as the longest running American Musical on Broadway (2nd only to Phantom of the Opera), and the longest running revival in the history of Broadway. Call Backs will be held in the chorus room on Thursday, December 13 beginning at 3:00 for guys and 3:45 for girls. Note: Keep in mind - Call backs are about character. Open Casting Girls Auditions will be held on Tuesday, December 4, 2018 beginning at 3:30 PM in the auditorium. La Salle Boys Auditions will, be held on Wednesday, December 5, 2018 beginning at 3:00 PM in the auditorium. Auditions will consist of a vocal and dance component. Audition Profile: Please Print Out and Complete the Audition Profile and bring it with you to auditions. See "Cast Listing" Section for a list of parts. Vocals: Please prepare at least two of the selections from the list / materials below. For this year's production, Only Juniors & Seniors will be considered for Lead Roles. Jill Baldassari (Ensemble) Jill is freshman at Gwynedd and is thrilled to be in her first La Salle musical. Some other shows she has appeared in are Bye Bye Birdie, Beauty and the Beast, The Wizard of Oz, and Les Miserables. She would like to thank the cast and crew of Chicago for making this production possible, as well as her family for their constant support. Jaylen Baron (Dance Captain) Jaylen is a member of an Elite Philadelphia Performance Ensemble and her performances include The Mount’s Productions of Les Miserable as well as Grease as Patty Simcox, Walt Disney World's Main Street USA Parade, the 6ABC Philadelphia Thanksgiving Day Productions, and the Philadelphia Mummer's New Year’s Day Parade. Jaylen has also been a member of the NYC Tap Crew, a sub division of New York based Retter Entertainment and has performed in events and in numerous shows acting, dancing, and singing in New York City. These productions include A Magical Broadway Christmas, Christmas in the City, Showbiz Kids on Broadway, This Way to Broadway - Almost There and have included singer Darryl "Run DMC" McDaniels, American actors Tony Danza, and Casey Simpson, as well as dancers Maddie Zeigler, Payton Ackerman, and Kendall Vertes from Lifetime Network TV Show - Dance Moms. This is Jaylen’s 2nd year in La Salle’s musical and is proud to have been chosen as Dance Captain in this year’s production. Laura Bennett (Ensemble) Laura is a sophomore and is elated to be in her second musical production at La Salle. Previously she has been in Les Misérables at the Mount, The Drowsy Chaperone at La Salle, and Grease at the Mount. She is the voice scholar of the sophomore class of Mount Saint Joseph Academy. She would like to thank Mr. Dominick, Mr. Dominick, Mr. Norman, and Louis Palena for the great opportunity to be in such a wonderful production, and the cast for being such an amazing family. Abigail Bernesky (Ensemble) Abigail couldn’t be more excited to be in her first musical at La Salle! She is in ninth grade at Gwynedd Mercy where she is involved with many music activities. Abigail’s love of music has taken her to Rome, Carnegie Hall, the Kimmel Center, and most recently, the Academy of Music. She would like to thank family, friends, cast and crew for all of their time and effort to make this show a success! Christopher Biddle (Dancer) Chris is a senior and is honored to end his journey on stage. He was in productions of Once Upon a Mattress, One Act Plays, Crazy for You, Addams Family, The Producers, and The Little Mermaid, and Bye Bye Birdie. Chris wishes the best of luck to his fellow cast and crew members and thanks Mr. Dominick, Louis, Mrs. Kelley. Most of all, he would like to thank his family for supporting him. Daniel Boyd (Ensemble) Daniel is a freshman at La Salle. He was previously seen in the ensemble in Gwynedd Mercy High School’s production of Bye Bye Birdie. He is excited to be in Chicago, and looks forward to many more shows in the future. Gianna Branca (Matron Mama Morton) Gianna, a junior at MSJA, is so excited to be performing in her third LSCHS Production, following The Producers and The Drowsy Chaperone! Additionally, she has been seen in Grease (Rizzo), Les Mis, and Footloose at MSJA. Outside of school, she has performed in many shows in the greater Philadelphia area, along with trained at S.T.AT.E. Summer Intensive and The Performing Arts Project. She would like to thank the cast and crew for all of their support! Gabrielle Broytman (Ensemble) Gabrielle is a freshman at GMA and she is super excited to be performing in her first LaSalle show! Some previous performances that Gabrielle has participated in include Bye Bye Birdie and Anything Goes. She wants to thank all the people working behind the scenes to make the show be possible, and her family for showing never-ending support. Patrick Calhoun (Dancer/Harrison) Patrick is a junior at LaSalle and is excited to be performing in his third LaSalle musical. He was previously seen in The Drowsy Chaperone (Gangster #2), and The Producers, as well as Bye Bye Birdie (Mr. MacAfee), The Little Mermaid, and The Addams Family at Gwynedd. Thanks to both Mr. Dominicks, Mr. Norman, Louis, Mrs. Kelley, and the entire cast and crew for helping to put on a great production. Special thanks to his family and friends for their support. Enjoy the show! Chris Carenzo (Dancer) Chris is a senior at La Salle College High School, and this is his second La Salle show. 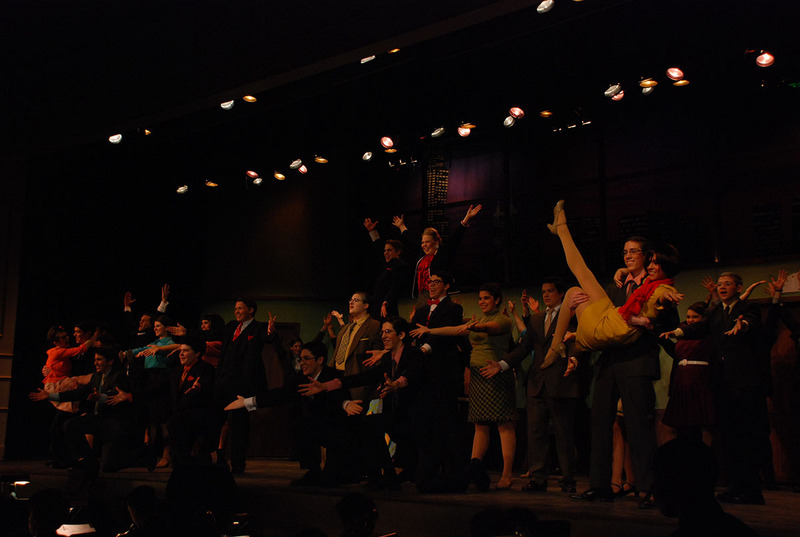 Previously Chris was in The Drowsy Chaperone in the ensemble and in Grease at Mount as Doody. Chris is excited to be able to perform Chicago. Chris would like to thank both Mr. Dominick’s, Mr. Norman, Louis, and Mrs. Kelly! Isabella Carlo (Annie) Isabella is thrilled to be in her fourth and final production at LaSalle College High School. She has appeared in several other shows at Gwynedd Mercy Academy and Dutch County Players. It is bittersweet for her to perform with her family one last time. Isabella would like to thank her family, her friends, the cast and crew of Chicago, Mr. Dominick, Mr. Norman, and Mrs Kelley. Daniel Cassidy (Dancer) Daniel is a senior at LaSalle. He is thrilled to be appearing in his fourth LaSalle show. He was recently in LaSalle’s The Producers (Lead Storm-trooper) and The Drowsy Chaperone. He also was in Addams Family (Lucas), The Little Mermaid (Flounder), and Bye Bye Birdie (Mr. MacAfee) at Gwynedd Mercy. Dan also performs with PMEA District Chorus and Philadelphia All-Catholic Chorus. Dan also is in Broadway Wishes. He thanks The Dominick’s, Louis, and Mr. Norman! Dee Cassidy (Mary Sunshine) Dee is a senior at Gwynedd Mercy Academy and is thrilled to be appearing in his first LaSalle show with her brother Dan. Sean Corr (Dancer) Sean is a junior at La Salle. He is excited to be in his third musical at La Salle. He was previously featured in Footloose, Les Mis, and Grease at MSJA. Sean would like to thank the cast and crew and especially Mr. Dominick and Mr. Norman for another incredible production. Jake de Luca (Master of Ceremonies) A Junior at La Salle, Jake is performing in his second La Salle musical. Since then, he was featured in La Salle's production of The Producers. Jake is thankful for the support of his family and friends during the making of the show. He is excited to present Chicago, and to work with such an amazing cast and crew. Daniela Diaz Conty Fonseca (Dance Captain) Daniela is a senior at Gwynedd Mercy Academy High School and is very excited to participate in her third and last La Salle musical. She has participated in Gwynedd's fall musicals and La Salle’s spring musicals for the past two years, and was a part of Broadway Wishes, a student run charity show taking place at La Salle with proceedings for the Make-A- Wish Foundation, and is very excited to be a part of the production team for this year’s Broadway Wishes! She would like to thank her family for always supporting her and the cast, crew, directors for making it an amazing experience! Nathan Esser (Dance Captain) Nathan is thrilled to perform in his 3rd LSCHS show. Last seen at GMAHS in Bye Bye Birdie (Conrad), Little Mermaid (Scuttle), and Addams Family (Fester). Nathan has performed at Walnut Street Theatre (Michael U/S, Mary Poppins), Bristol Riverside Theatre (Morten, Enemy of the People), and Media Theatre (Michael, Billy Elliot). He was also recently seen at Walnut Street Theatre in Aladdin Jr. and co-host in Animal Planet’s Tanked Jr.
JV Fluehr (Billy Flynn) This is JV's fourth and final production at La Salle and he is both excited and sad to be performing on La Salle[? ]s stage for the last time. His past roles include: Albert Peterson in Bye Bye Birdie, The Superintendent in The Drowsy Chaperone, Sebastian in The Little Mermaid, Franz Liebkind in The Producers, Uncle Fester Addams in The Addams Family, and ensemble in both Nice Work if You Can Get It and Crazy for you. He is currently a Senior at LaSalle and is looking forward to production of Chicago! He would like to thank his parents, the directors, and his friends, for supporting him through the entire show. He hopes you enjoy the show and that everyone else breaks a leg! Maggie Fluehr (Ensemble) Maggie is a Junior at GMA and is beyond excited for the show this year. Maggie has taken part in many productions including Addams Family, Little Mermaid, Drowsy Chaperone, Bye Bye Birdie, and Broadway Wishes. She would like to thank her parents, brother and her friends and cast mates for making this show memorable. Lastly, she would like to wish her older brother good luck on his last LSCHS show! Break a leg everyone! Olivia French (Ensemble) Olivia is so excited to perform in her first production at La Salle! She would like to thank the cast of Chicago, her family, friends, and the staff who participates in making the show. Some of her previous shows are; Anything Goes, The Little Mermaid, The Wizard of Oz, and Bye Bye Birdie. Special thanks to Nina French, Mort French, and Jana Senderling for taking me to practice!! Clare Gimpel (Dancer) Clare is a sophomore at the Mount and is grateful to be performing in Chicago, following last year’s The Drowsy Chaperone. She would like to thank her family for their endless support. She gives special thanks to Mrs. Kelley, Louis, Mr. Norman, Mr. Dominick and the entire cast and crew for this memorable experience. Julia Guerin (Kitty) Julia is a senior at Gwynedd Mercy Academy and is excited to be returning to the stage for her last La Salle High School musical. Julia has been a part of many shows including, Once upon A Mattress, The Addams Family, The Little Mermaid, and Bye Bye Birdie at Gwynedd, also Crazy for You, The Producers, and The Drowsy Chaperone at La Salle. She has also taken part in Broadway Wishes a charity performance with Mount, Gwynedd, and La Salle students. She is excited to be preforming in her last La Salle show preforming alongside her best friends. She would like to thank her family, the cast, the crew, Mr. Dominick, Mr. Norman, and everyone involved in making such an amazing show. Lauren Halferty (Ensemble) Lauren is a junior at Gwynedd Mercy Academy High School and is beyond thrilled to be performing in Lasalle’s production of Chicago! She has previously been seen in the ensembles of Gwynedd’s The Addams Family and The Little Mermaid, and most recently, as Mrs. Macafee in Bye Bye Birdie. She has also been a participant in Broadway Wishes for the past two years and is ecstatic for this year’s production! She would like to thank the cast and crew for making this such an amazing experience and hopes everyone enjoys the show! Caroline Jakubik (Ensemble) Caroline, a junior at the Mount, is excited to be appearing in her first La Salle musical! Previously, Caroline has been in MSJA’s Footloose and Grease, and portrayed Young Cosette in MSJA’s Les Mis. She would like to thank her family and friends for their unending support. Patrick Jakubik (Ensemble) Patrick is a freshman at La Salle. He is very excited to be doing his first La Salle show performing Chicago. Previous shows include Grease at MSJA, and Shrek at his former middle school in the role of Donkey. He would like to thank his friends and family for helping him get this far and the cast for making this an amazing show. Erin Jolly (Ensemble) Erin is a sophomore at Gwynedd Mercy. She is so excited to be in her 2nd musical here at La Salle. Erin was previously featured in GMA's The Little Mermaid, as well as Bye Bye Birdie, playing the role of Mrs. MacAfee. She would like to thank her parents for their tremendous support over the past couple of years and her fellow cast members for putting on a great show! Lucky Kawczynski (Dancer) Lucky is a sophomore at La Salle. You may have seen him in the Drowsy Chaperone and The Little Mermaid and Bye Bye Birdie at Gwynedd Mercy. Lucky would like to thank everyone who helped make this show possible and hopes that everyone enjoys Chicago! Kennedy Kelly (Liz) Kennedy is a senior at Gwynedd Mercy Academy High School and is ecstatic to be performing in her third and final LaSalle musical. Kennedy has participated in many shows including Bye Bye Birdie (Kim MacAfee), The Sound of Music (Maria), Once Upon a Mattress (Ensemble), The Addams Family (Ensemble), The Producers (Usherette), The Little Mermaid (Aquata), The Drowsy Chaperone (Ensemble). Kennedy would like to thank her cast, crew, directors, and family, for their continued support through her high school career. Jack Kennedy (Amos Hart) Jack is a senior at La Salle, and finds it bittersweet to be performing in his fourth and final La Salle musical! Jack has proudly been a part of the La Salle and Gwynedd shows all throughout high school, and is heavily involved with Broadway Wishes. He plays soccer and tennis for La Salle, cherishes his time down the shore with his family, and is a lover of old music. He can also quote The Office and Elf effortlessly. Jack is really going to miss all the friends he has made during the last four years, and he thanks everyone who supports his endeavors, including the Mr. Dominick’s, Mrs. Kelley, Louis, Mr. Norman, and his family, but especially his car, Bruce. Amanda Lamphere (Roxie) Amanda, a senior at MSJA, is thrilled to be in her third LSCHS production. Previous roles include Sandy in MSJA’s Grease, Éponine in MSJA’s Les Mis, and a dancer in LSCHS’s The Drowsy Chaperone and The Producers. She would like to thank her family and friends for their constant support. She would also like to thank all of the production team, cast, and crew for their hard work on this production and for making her final high school show so memorable. Erin Maguire (Ensemble) Erin is a Sophomore at the Mount and is thrilled to be appearing in her first La Salle musical. She was previously featured in Les Miserables and Grease at the Mount, and performed in many musicals at Narberth Community Theatre, Upper Darby Summer Stage, and Music Training Center Ardmore. She would like to thank the cast, crew and her family for their endless love and support. Ella Martin (June/Dancer) Ella, a junior at MSJA, is thrilled to be performing in her second LSCHS Production. In addition to The Producers at LaSalle, she has been seen in Grease (Jan), Les Miserables, and Footloose at MSJA. She has also had the opportunity of training at Broadway For All in New York City (2015-17). She would like the thank the entire production team and cast for making this such an incredible show. Grace Mascio (Velma Kelly) Grace is a senior at Gwynedd, and is honored to play Velma Kelly in Chicago. Chicago marks her fourth and final La Salle musical, in the past four musicals she was an ensemble member, and a dancer. Grace has also participated in the fall musical at Gwynedd, and is so excited to be on the production team for Broadway Wishes. She is extremely thankful for this opportunity, and cannot wait for another amazing performance with all her fellow actors and friends. Grace is extremely thankful for her family and friends, and for all their support! She wants to thank everyone who helped make this show come to life especially the Directors, Producers, Louis, Mrs. Kelly, and the cast and crew! Jake McCabe (Fred Casely) Jake is a junior at La Salle College High School. He is excited to be performing in his third La Salle Musical. He was previously in The Producers, The Drowsy Chaperone, Grease, and Les Miserables. Jake would like to thank his family and all the directors, producers, and cast members for another amazing La Salle production. Lucas McCabe (Ensemble) Lucas is a freshman at La Salle College High School and he’s honored to be a part of this production. His previous roles include Charlie Brown, You’re a Good Man Charlie Brown, Winthrop in The Music Man, Jack, Into the Woods Jr., and Rooster in Annie Jr. and most recently ensemble, in Grease at the Mount. He would like to thank his family, friends, cast, and crew. Jenna McCrea (Hunyak) Jenna is a junior voice scholar at MSJA. Previously, Jenna performed in Footloose (MSJA), The Producers (LSCHS), Les Mis (MSJA), The Drowsy Chaperone (LSCHS), and Grease (MSJA). She would like to thank both Mr. Dominick’s and Mr. Norman for this opportunity. Of course, a special thanks goes out to her friends and family for their continued love and support. Sheila McGreevey (Ensemble) Sheila is a junior at Hatboro-Horsham High School, and she is so excited to be in her second LaSalle show. Some of her favorite past performances have been LSCHS's production of The Drowsy Chaperone and HH's productions of The Hunchback of Notre Dame (gargoyle) and Dogfight (librarian/Rose und.) Sheila would like to thank her parents, sisters and friends for their continued support. Matthew McHugh (Sergeant Fogarty) Matthew is a senior at La Salle College High School. He is very excited to participate in his fourth and final performance at La Salle. He has also performed in GMAHS’s The Addams Family, The Little Mermaid, and Bye Bye Birdie. He is grateful for his family and all those involved especially Mr. Dominick, Mr. Norman, Louis, Mrs. Kelley, his cast-mates, the band, stage crew, lights, and sound! Aidan Melinson (Dance Captain) Aidan, a current senior, is excited to be performing in his last high school show and beyond grateful to have spent the last two years as part of the LSCHS theatre department. While he regrets not getting involved sooner, the decision to join was one of the best he's ever made and he would like to thank everyone who encouraged and supported him along the way in this endeavor. Kyle Mullen (Ensemble) Kyle is a sophomore at La Salle who is excited to return to its stage for the second time. He previously was part of the ensemble of The Drowsy Chaperone. He is also excited to involve himself with the Broadway Wishes production for the first time later this year. Kyle thanks the faculty, staff, parents, and students that brought Chicago together. Bryan Nolan (Aaron/Dancer) Bryan is a Senior at La Salle College High School and is excited to come back for his fourth and final year in the LaSalle productions. He has been doing theater for eleven years and is happy that he has continued his experience at LaSalle over the past four years. He is extremely excited to be working with such a wonderful cast and crew of close friends he has made over the past four years. He is also happy to be under the direction of, Mr. Dominick and Mr. Norman. He would like to thank his family, his friends, and his cast members for supporting his efforts to do the best he can in his last show at LaSalle College High School. He thanks you for coming and hopes you enjoy the show. Jake Pensabene (Dancer) Jake is a junior at LaSalle College High School and is thrilled to be performing as a dancer in Chicago - his third show with the school. His previous productions include The Producers and Drowsy Chaperone with LaSalle as well as Grease and Les Mis with Mount. Jake would like to thank his family and friends for their constant support, along with the entire production team and cast of Chicago for putting together such a great and enjoyable show. Ellie Perry (Ensemble) Ellie is a freshman at LC. She is so excited to get to be a part of La Salle’s spring musical. She is also excited to get to be a part of the musical with her brother. She has previously been in all of her grade school musicals; like the Lion King, The Wizard of Oz, Mary Poppins, and many more. She would like to thank everyone who made this possible, especially the cast and crew. Sam Perry (Ensemble) Sam is currently a freshman at LaSalle who is very excited to be a part of his first LaSalle show. He has been a part of many other plays including Mary Poppins, Bye Bye Birdie, and The Sound of Music. Sam would like to thank everyone who made this play possible. He would also like to thank the cast and crew for being so welcoming. Erin Plamondon (Dancer) Erin, a junior at Gwynedd, is thrilled to be part of the production of Chicago! She has loved performing in the past three Gwynedd shows, The Little Mermaid, The Addams Family, and Bye Bye Birdie. She has also enjoyed participating in many community theater productions for example, Aladdin, The Sound of Music, Godspell, Into the Woods, and also Broadway Wishes. She would like to thank the cast and all who have made this such an amazing experience and hope everyone enjoys the show! Sophie Pugh (Dancer) Sophie is a freshman at Abington Friends School and is thrilled to be a part of her first La Salle Musical. Sophie most recently appeared in Abington Friends Schools Fall production of You're a Good Man Charlie Brown as Sally Brown. Some of her other recent credits include Rosie Brice in Funny Girl, Eulalie Mackechnie Shinn in The Music Man, and Reno Sweeny in Anything Goes. She would like to thank her family and friends for all of the endless love and support, and the entire cast and crew of Chicago for making this show such an amazing experience. Michael Reed (Ensemble) Michael is a freshman at La Salle. Michael is very excited for his first performance on the La Salle stage. Michael sends a heartfelt thank you to everyone who has made it possible for him to be a part of this musical. He hopes to make you all proud. Jana Senderling (Dancer) Jana is a junior at Gwynedd Mercy Academy. She is so happy to be performing in her third La Salle production! She previously was in the ensemble for The Addams Family, The Producers, and The Drowsy Chaperone. She was a Mersister in The Little Mermaid and played the role of Kim McAffee in Bye Bye, Birdie. Jana wishes the best of luck to her fellow cast and crew! Cassandra Smith (Ensemble) Cassie is a sophomore at Gwynedd Mercy. She is thrilled to be appearing in her first La Salle musical. She has previously starred in Annie, Alice in Wonderland, The Wizard of Oz, and Shrek at OLMC and The Little Mermaid and Bye, Bye, Birdie at GMAHS. Cassie would like to thank the wonderful cast, crew, and directors of Chicago for making it such a wonderful production! Julia Smith (Ensemble) Julia is a junior at Gwynedd Mercy Academy and is thrilled to be appearing in her first La Salle musical. Her previous shows include The Addams Family, The Little Mermaid, and The Mayors Wife in Bye Bye Birdie (GMA), Dorothy in The Wizard of Oz, and The Cheshire Cat in Alice in Wonderland. She would like to thank her friends and family as well as the entire cast and crew for this amazing experience. Matthew Tomlinson (Judge, Dancer) Matthew is a junior at LaSalle College High School. He is excited to be performing in his third LaSalle Production. In addition to Chicago, Matthew has been in Grease (Roger), Les Misérables (Bishop), The Drowsy Chaperone (Dancer), The Producers (Ensemble), and Seussical Jr. (Wickersham Brother) in the Bucks County Playhouse Youth Company. Matthew would like to thank his parents and family, the production staff, the cast, and the stage crew who made everything possible. Will Vanni (Ensemble) Will, a Sophomore at La Salle College High School is excited to participate in his second La Salle show. He previously played the role of Gavroche in the Mount’s production of Les Mis and was a cast member of grease. He was also a cast member in LaSalle[? ]s version of The Drowsy Chaperone. Jack Ventresca (Court Clerk) Jack is a Junior at La Salle. He is so excited to be taking part in his third La Salle musical. Jack would like to thank his family and friends for all their support, as well as the whole cast for an amazing year! EJ Whitaker (Ensemble) EJ is a sophomore at La Salle High School. He is thrilled to be in his second production at La Salle High School. EJ has participated in theater since 4th grade, and most recently he was seen in the cast of Bye Bye Birdie at Gwynedd. EJ would like to thank the cast, crew and all involved in the production of Chicago. Jeffrey Wilson (Dancer) Jeffrey is a sophomore at La Salle and is very excited to be in his second La Salle musical. He is especially happy about his move up from his freshman year, going from ensemble to dancer. Colleen Yezzi (Mona/Dancer) Colleen is a senior at the Mount and is so ecstatic to be in her fourth and final show at LaSalle! She has also previously been in musicals at the Mount, and has participated in Broadway Wishes since her freshman year. Colleen would like to thank Mr. Dominick, Mr. Norman, Mr. Dominick, and Mrs. Kelley for their hard work and dedication to this production. She would also like to thank her family, friends, and the entire cast and crew. Great show everyone! Declan Young (Ensemble) Declan is a junior at La Salle and is thrilled to be in his second La Salle musical. Declan was also featured in the Drowsy Chaperone at La Salle and Grease at MSJA. Special thanks to the cast and crew for making the show such a great experience. This fall La Salle will once again turn the director’s chair over to the students through a series of student directed one act productions. Productions may be legitimate one act plays; student written works; an episode of a TV show; or any other production that would fit the definition of a “one act” play. Students will work in a supervised environment where guidance, coaching, and critiques of the work throughout the process will be provided, but ultimately all production responsibilities from casting to costuming, and set through lighting design will reside with the students. This is a very exciting undertaking and one in which we invite the girls from outside La Salle to participate – provided that members of the production team and cast are La Salle College High School students. Performances be held on Friday October 20 and Saturday October 21 at 7:30PM. Each year students from La Salle College High School, Mount Saint Joseph Academy, Gwynedd Mercy Academy and other surrounding public schools, come together to perform numbers from various musicals where all proceeds go to benefit the Make-A-Wish foundation. Please help us to reach our goal of $20,000!!! For more information, visit www.broadwaywishes.com.